Photovoltaic Systems is a comprehensive guide to the design and installation of several types of residential and commercial PV systems. Numerous illustrations explain the concepts behind how PV arrays and other components operate, and photographs of actual installations show how components are integrated together to form complete systems. 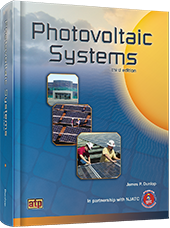 This textbook addresses the PV topics included inthe NABCEP Entry Level Program. This new edition also covers 2011 NEC® requirements. A CD-ROM is also included with Photovoltaic Systems and contains information to supplement the textbook. There is a Solar Time Calculator app available that can be used in conjunction with Photovoltaic Systems. For more information and to purchase the Solar Time Calculator, click here.